Dave — lovely to see you and bon voyage to Virginia! I was absolutely shocked to learn that one of the songs Johnny Cash sings that I find most moving was actually written by Sting ("I hung my head"), taking place in Ireland rather than in Texas as I'd imagined. But Johnny Cash sings it so much better — he knows his suffering and doesn't exalt himself as Sting does when singing it. I'm still a Sting fan but the Johnny Cash version of "I hung my head" is way better. Also, it's in 4/4 time instead of String's distracting 5/4. Sting has always had a weakness for clipping a beat or adding a beat to phrase structures just to get an assymetric meter. It's one of the things I've never liked about him. He's a competent songwriter but I'd have to say that Cash improved on his song. Then again Cash could take pretty much anyone else's song and improve on it. I saw Johnny Cash and Ray Charles as both being performers who could so mutate the works of others that they pretty much owned them. And Sting has tended to be in the category for me where if OTHER people are performing his work you can get a sense that he is, despite his often overly slick productions, a decent songwriter. Plus compared to other rock stars tackling classical music in older age his Dowland album can't be as bad as McCartney's oratorio or as tepid as Billy Joel's piano work. I also love Cash and will look up the versions mentioned here. But I don't think that the world is a worse place for having Sting make music…I love his version of I Hung My Head, although I agree that Cash can sing that with more weight and meaning. I think the statement 'Sting is unlistenable' , though, is kind of interesting in the sense that if Sting is unlistenable…who is listenable???? 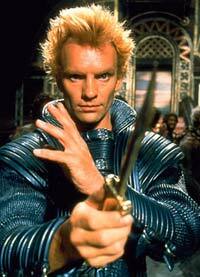 Sting produces serious music in the midst of o lot of non-serious musicians…I would certainly give him that. What comes to mind for me is the general concept that art is appreciable only to the degree that you have knowledge of it. So, by that line of thinking…Matisse is a moron, Bach is a windbag and wine tastes like vinegar.